Controlled lighting allows you to create the perfect setting in your home. An integrated system, along with motorized shades and draperies, enables you to adjust the aesthetics to your liking. With the touch of a single button, you can select scenes for different scenarios, such as "reading," "cocktail party," or "movie viewing." Imagine hosting a dinner and pressing one button to light the interior and exterior of your house in the most attractive manner. Your control panel will enable you to manage the lights throughout the entire house from any one location. Lighting also creates a more secure home. As you approach your driveway, exterior flood lights automatically turn on, lighting the pathway from your garage to your home. Should you hear a strange sound in the middle of the night, with the push of a single button, you can turn on all the lights in and around your home. When you leave for vacation, you can press one button so that the lights turn on and off during pre-set times and the shades open and close to create a lived in look. 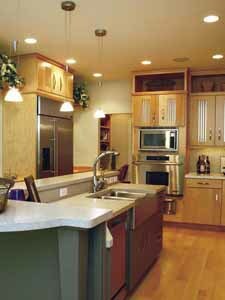 Integrated lighting solutions add value to your home. In addition, the system increases your homes efficiency by reducing expenses. Preset timers can conserve power and save you money. The same wiring that commands the lights can also control lawn irrigation and pool temperature. With controlled shading solutions, you can easily raise the shades to add sunlight or lower them to reduce heat buildup and have instant privacy. Shades can be pre-set to automatically open and close during a specific time of year, effectively controlling sunlight to prevent harsh U/V rays from damaging expensive furnishings. If you prefer to operate the shades yourself, you can simply push a button to adjust the shades at your convenience. Either way, you'll be able to achieve the greatest beauty and efficiency in each room at all times. © 2010, LVC System Design. All rights reserved.